Now that the Senate Democrats have amassed enough votes to filibuster and block the confirmation of Donald Trump’s controversial Supreme Court nominee Neil Gorsuch, it turns out Senator John McCain is lashing out – at his own Republican Party. With some Senate Republicans hinting at changing the rules to permanently eliminate the filibuster for nominees, McCain is calling them stupid idiots. In those exact words. 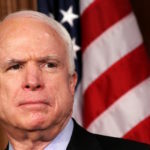 Senator McCain criticized any Republican Senators who think it would be a “good idea” to permanently eliminate the filibuster for Supreme Court nominees. He minced no words with reporters, exclaiming “Whoever is that is a stupid idiot.” NBC News captured the remark, which you can watch below. McCain did not mention anyone by name, but there was no question he was referring to one or more Senators of his own party. This weekend Senate Majority Leader Mitch McConnell publicly threatened in television interviews to invoke the ‘nuclear option’ by sabotaging the filibuster.